Yep, we're having baby #3! 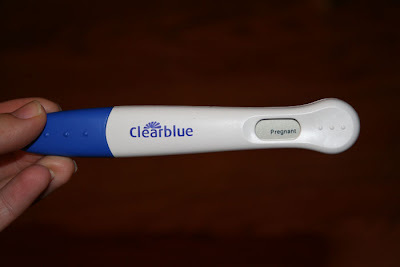 Although we're very excited, unfortunately, i've also been very sick (as I was with my pregnancies with Noah and Chloe). Hence, the reason for my blog slackiness. I have basically been a slug for the past two months, and it's been hard to do much of anything that resembles my usual routine. However, I did get meds to help with the sickness the other day, and although the meds don't do miracles, they do take the edge off. Plus, as i'm almost out of the 1st trimester, I do find myself having more "good" days, so I'm feeling optimistic that i'll be back to my normal routines soon. Congrats, Staci, I am so excited for you and your family!! Beautiful work with the kit....next months look's amazing, too! woo to the hoo ! yeah! that's a ery happy reason to be away from blogland ,my friend ! another adorable , scrappable , gorgeous kiddo to scrap by this year too ! lol ! Oh Staci...this is such wonderful news and the best reason for being a slacker......I am so happy for your family!!! Love the goodies that you created...now take care of yourself and before you know it you will be feeling better!!! 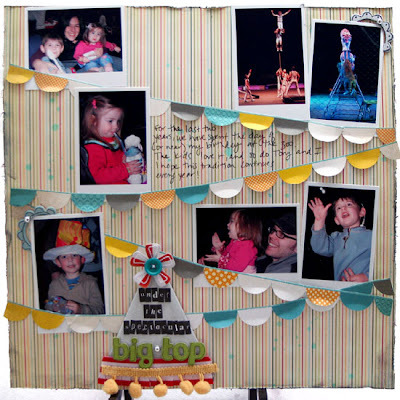 Awesome layouts - love how you worked in the measuring tape paper and the circus layout is GREAT! You know I am so thrilled for you!!! Congrats to you and your fam. Your stuff is gorgeous, as always! WOW, congrats!!!!!! that is awesome news, I am so happy for you! CONGRATULATIONS... That is awesome news. I hope you do feel better soon, those days are not fun. The LOs are amazing. Gorgeous work. eeeeeeekkkkkkkkkkkkkkkkkkk Staci that is the most exciting news ever! congrats to you and the family...bigggg hugs!! now your pgs. are sooooo super..gosh so in love with the big top pg...such fun pgs.! Congratulations! That is wonderful news! :D Hope you feel better soon. WOOOOOOHOOOOOOOO - now that is the best reason ever, chickee!!! I am truly excited for you but sorry that you are feeling sick. I already knew this but congrats again!! oh yay..congrats to you and your family, Staci!!! Congrats Staci... so happy for you! Rest well.... your projects and LOs look great! I've got tears in my eyes!!! HUGE congrats, sweetie. I'm so excited for you. Hope the tiredness goes away soon so you can enjoy the rest of the pregnancy. LOVE your work on the kit! YOu're such an inspiration. Well, of course, I already knew this you CHA party pooper!! LOL I hope you are feeling "much" better now. I've been wondering about you!! Again, I am beyond happy for you!!! Hugs girlie!! Congrats Staci!!!! I wish you a healthy and happy pregnancy! Congratulations, Staci! I'm sure the kids are very excited for a new baby to be on the way! Love your projects... your banner work is crazy good!! congratulations staci!! I'm so happy for you - and you don't have to explain - we all understand - and are glad you post when you do. Hope the yuckiness goes away soon. HUGS! Hi Stranger to you too...but you have a fabulous reason! Congrats girlie, I am thrilled for you guys! And us because now you have another reason to scrap beautiful stuff! Oh super congrats Staci! so excited for you!!!! Totally a good reason to be slacking!!! Great work with the kit!!!! OMG OMG OMG!! HUGE congrats to you!! Congrats Staci!!!!! That is so exciting!!! Love your layouts! 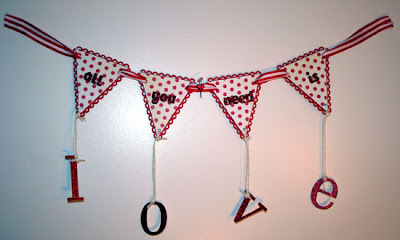 I have been into banners lately too, must be that adorable Dear Lizzy line that I am in love with!! OHHHH MY GOSH!!!! Big CONGRATS!!!! Wow, that is some awesome awesome news!!! Hope you get over the sickness soon, take care of you and that bun!!! Big Congrats Staci...hope you start feeling better!!! Woot, woot!! Such fabulous news, my friend! Huge congratulations to you and your entire family! 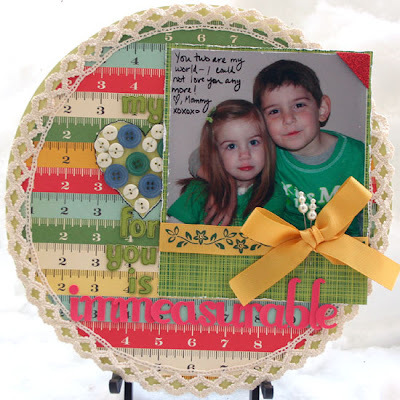 LOVE your kit projects! fabulous stuff. Wow Congrats on the baby news that is wonderful!! !